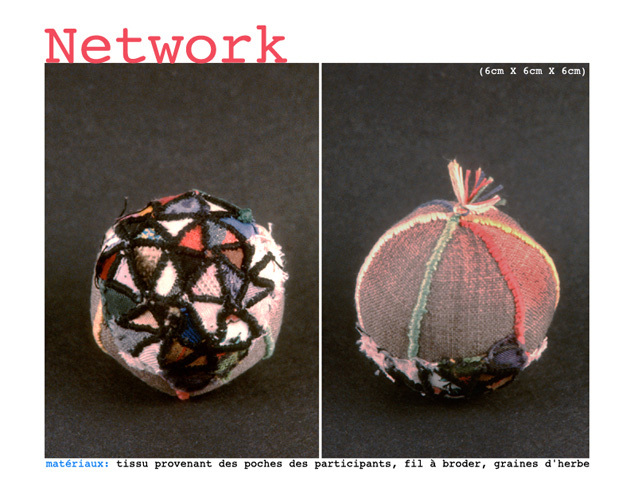 Pocket jewellery; 6x6x6cm, 1997, Basel and Barcelona. Patchwork of fabric pieces cut out from the pockets of over thirty friends who would receive in return a piece of my own dress to patch up the hole left in their pocket. The little ball is filled with grass seeds. 1999, Le mois de la photo, CIRCA, Montreal. Interactive installation during which visitors were invited to borrow wearable objects and take them out of the gallery, into public spaces. These "borrowers" were asked to give a temporary title to their object (labeled from A to Z) and to document their experience through snapshots and written commentaries. The information was returned to the gallery to feed this cumulative exhibition and maybe influence the next participants. While in transit, the objects were replaced by a BOLM ID card of their borrower, stating name, title, and date of proposed return. The file cabinet now contains 88 texts and portraits of the fifty borrowers in Montreal and thirty-three in Toronto, together with their 1700 pictures. Box wearable as a bracelet, made of wood, fabric, feathers, plastic, metal, hair, with accompanying booklet, 12x9x9cm, 1999, Montreal and Zürich. Thirteen AIDS afflicted children participated in the project by drawing a self-portrait, voicing their wishes (documented in the booklet), and giving a hair sample to put on the angels' heads inside the box. Fundraiser for The Lighthouse, an AIDS hospice in Zürich. 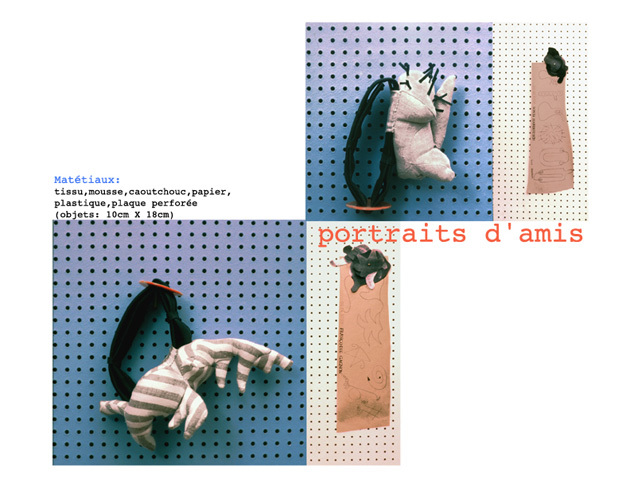 Biceps bracelets in fabric, stuffing foam, plastic, rubber inner tubes, 12x10x10cm, 1999, Montreal. Fourteen participants drew spontaneous outlines as templates for building objects that represented their mood of the moment, and could in turn be worn by other friends. Game made of seal fur, caribou teeth, 18kt gold from Nunavut, sterling silver, copper and rubber, 22x20x20cm, 2001, Cambridge Bay in Nunavut. Sponsored by Lupin Mine (NU), collection of Nunavut Government. This is my version of the traditional Inuit game in which the players take turns using a string to fish one seal bone at a time out of a seal pocket, and construct a tundra story inspired by the bone shapes as they show up. 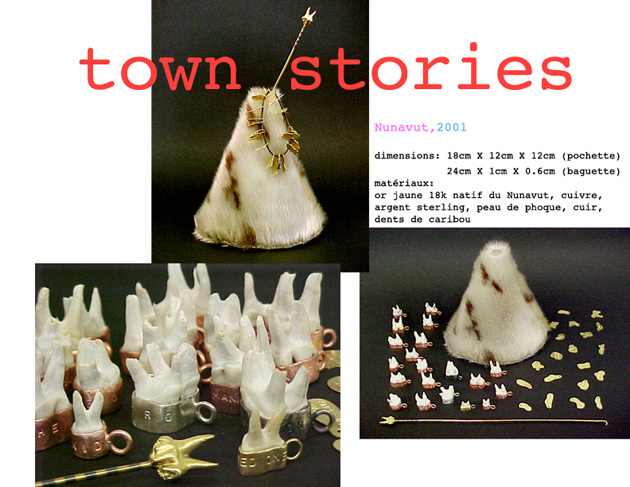 In Town Stories, the string is a tooth fairy's magic wand and the pocket is a volcano. The bones are caribou teeth set in gold, copper or silver, baring names of the various characters of a settlement�policeman, teacher, banker, nurse, housewife, etc�and a set of pond shapes in gold bearing names of various urban settlements�school, jail, church, store, etc. Then the players proceed with their gossip. 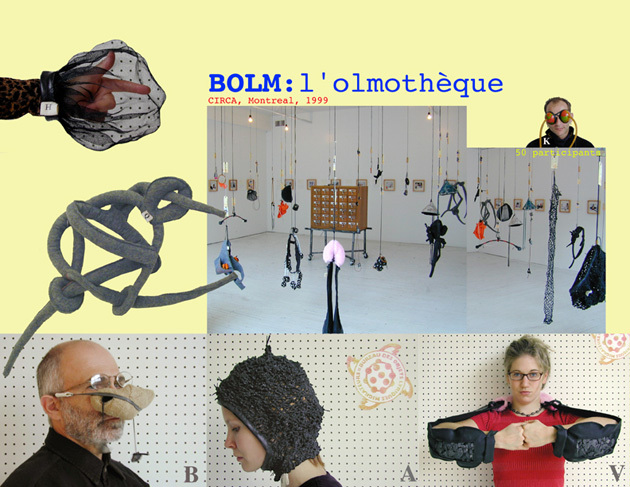 Second edition of BOLM: L'OLMOTHÈQUE, 2001, Contact Festival, Gallery 44, Toronto. 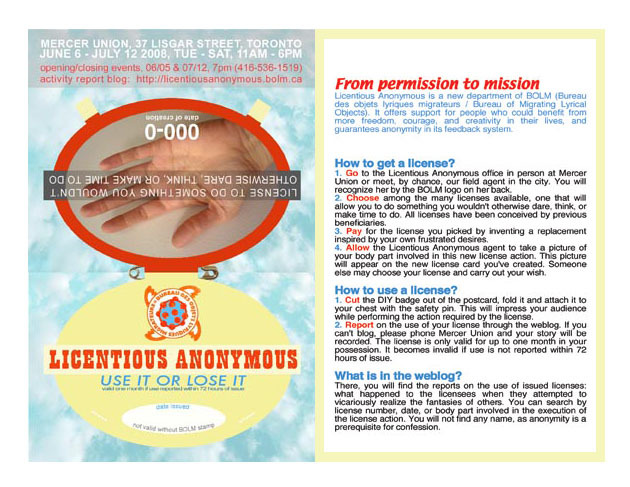 ID cards, 2001, Contact Festival, Gallery 44, Toronto. Migrating Lyrical Object 'S': backpack in rubberized fake fur, 66x42x29cm. Constructed from a clutter of hollow shapes representing various organs, the outside looks like burned tar while the inside is soft and vulnerable in baby-pink fur. Migrating Lyrical Object 'W': urban-commando belt with Dalmatian velvet-wrapped industrial objects, namely, an electronic car key, matches, flashlight, doggy toy, pacifier, yo-yo, and others. Scarf made of clothing, fake fur, ink jet transfers; 3.5m x 37cm x 30cm, 2001, project in residence at Nova Scotia College of Arts and Design, Halifax. Twenty-one participants from the NSCAD community contributed one of their used pieces of clothing to the project, along with a favorite word and a list of ways they would like to be treated if they were turned into clothing themselves (e.g. : 'Love me even when dirty'). The favorite word have been cut out of the clothing and reassembled to create a stuffed bundle. 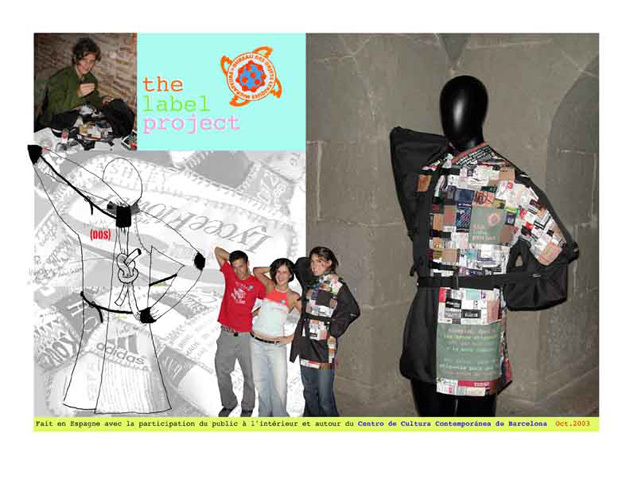 Each bundle bears a label showing the selected word, the care instructions, and an image of the participant wearing the chosen piece of clothing. All portrait-bundles are connected to one another by a furry umbilical cord. Recycled inner tubes, film containers, negatives and photo filters, 2001, NSCAD, Halifax, shown at Harboufront Center, Toronto, 2003. 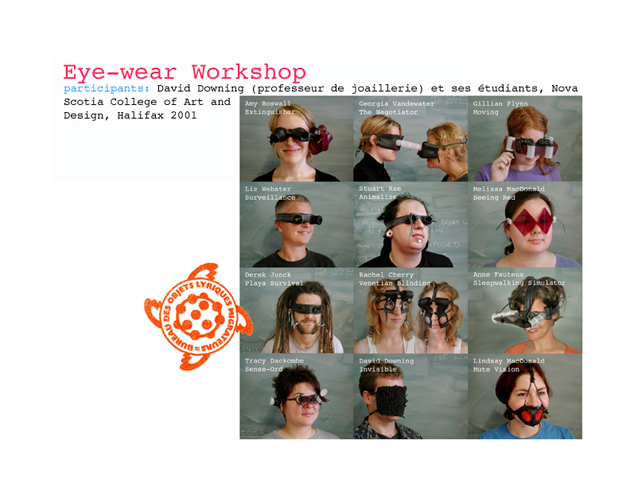 During a workshop as guest artist at NSCAD, I guided the students and their teacher to produce vision apparatus that could be part of a BOLM collection. Our pieces are presented in a series of 12 portraits as proof of the successful functionality. Recycled inner tubes, film containers, negatives and photo filters, 2001, 30x22x15cm, NSCAD, Halifax shown at Harboufront Center, Toronto, 2003. 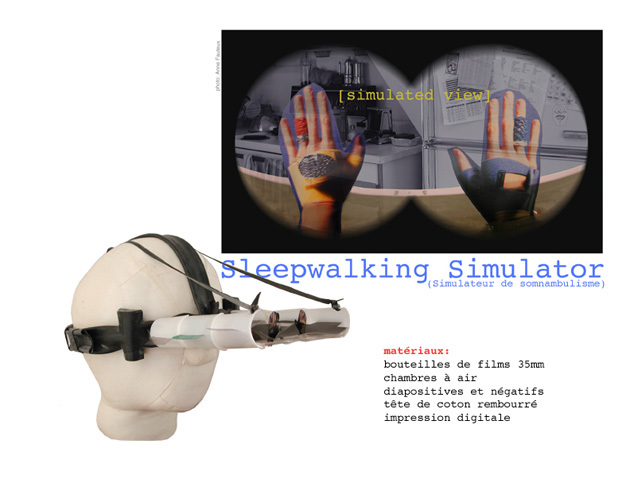 My own Eye wear prototype in the Eye Wear workshop, simulating what one would see while sleepwalking, hands stretched out to avoid tripping on obstacles. 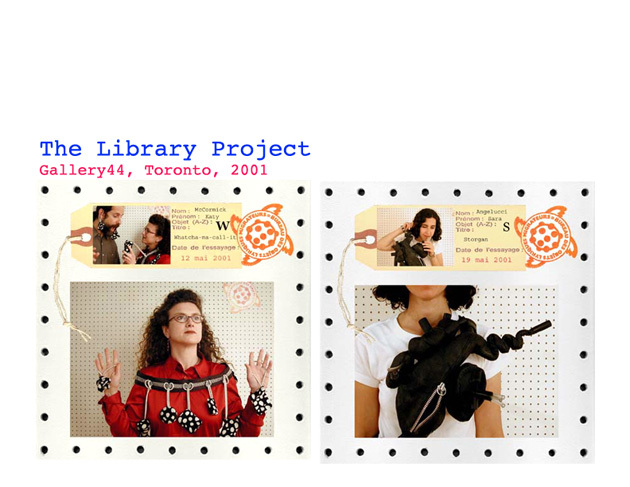 Wearable objects, 18x12x14cm, 2001, Oakville Galleries, Ontario, and 2006 , Halifax. Small groups of participants in various contexts were asked to rip the labels off the clothes they were wearing. After being "de-branded" a picture of the group was taken. The labels were then randomly sewn together into an organic shape, then stuffed to make a wearable trademark-monster. 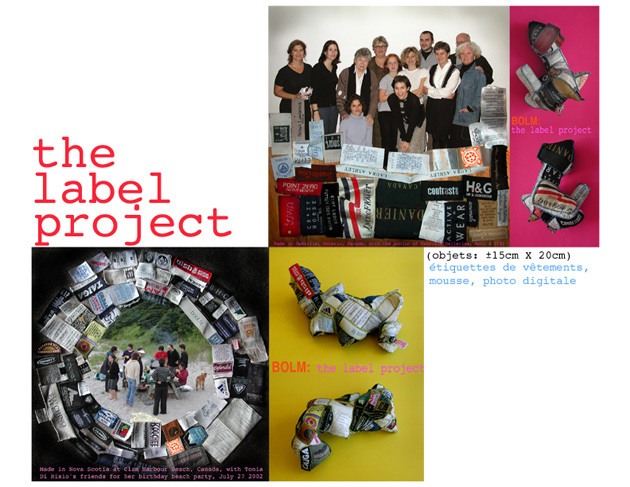 Over the following year, the label monster could be lent to any of the participants who wished to adopt it. Nine kids brought leftover single socks from home. They learned how to fill and sew them together while telling the story of the surviving socks' adventures (on recording). 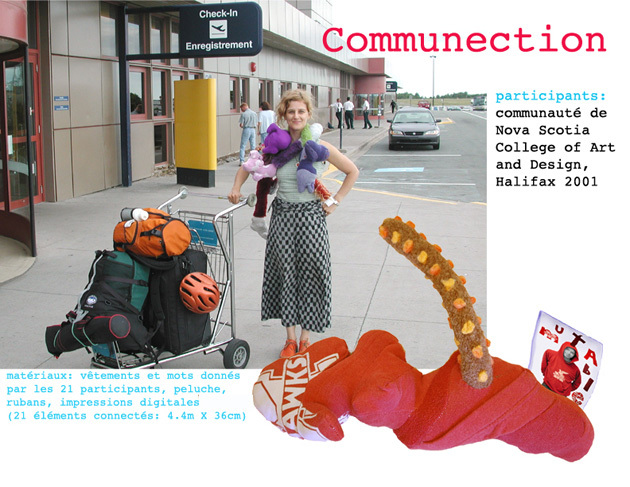 Intestine-like soft object that is worn coiled around the body; all recycled materials given by the Halifax community: men's business suits, shower curtains, baby pacifiers, letter envelopes, inner tubes, stuffed animals. 3.3m x 1.4m x 14cm, 90 min. video (collaboration with Sara Angelucci) , 3.5x3m drawing, 2002, Eyelevel Gallery, Halifax, and 2003 , Centro Cultural Contemporaneo de Barcelona. 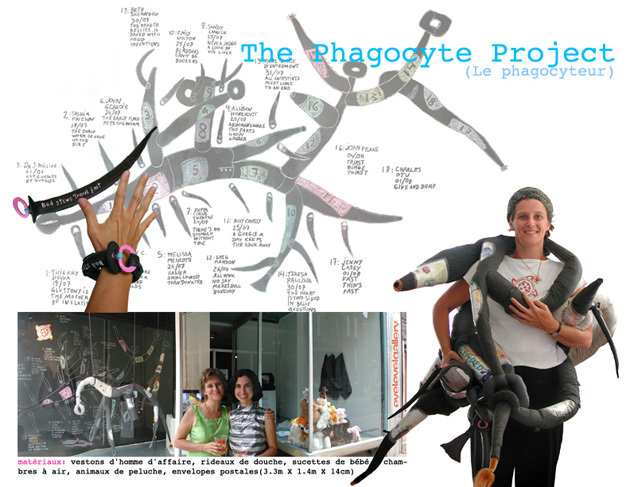 The Phagocyte Project is an evolving, interactive and transitory event. Resulting from transactions with eighteen consenting individuals met randomly in the streets, it became a fragmentary portrait of the Halifax community. 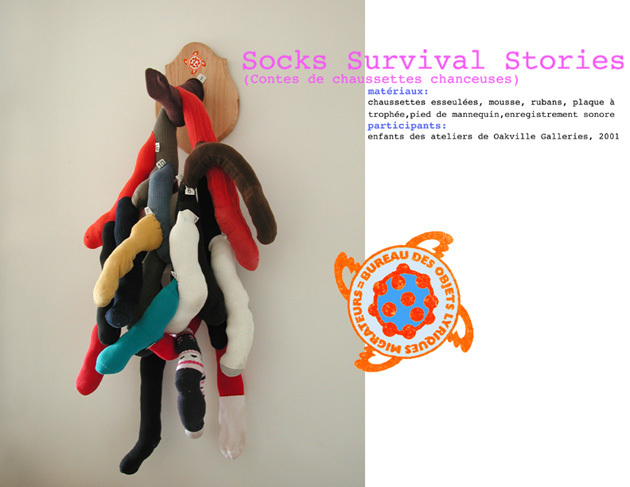 The participants were asked to donate a small personal possession and a comment about its meaning which were then embedded in this constantly mutating stuffed object. In exchange, they were given a sample of the Phagocyte. On each sample was written a twisted proverb (with a digestive theme) to be repeated persistently by its new owner until that neo-proverb spread around town. Through its urban safari, the Phagocyte accumulated meaning and weight, and exhaled poetry. The Phagocyte Project evokes our urge to possess and fear of losing (ourselves...). It also reminds us we are literally and figuratively "walking digestive tubes". In the gallery windows, along with the Phagocyte, were displayed a growing diagram of the piece and a video featuring the exchanges. Over 150 visitors to the museum and the surroundings donated their clothing labels which I publicly sewed on a custom made straitjacket, day after day to form a label patchwork. The participants' fingerprints were stamped in a booklet as their signature of the project. Thanks for their humility in letting go of part of their identity... As acknowledgment of their participation, the back of their necks or the side of their waists were stamped with the BOLM logo. Mobile repair studio entirely made of recycled materials found on sidewalks, including the materials added to the clients' objects, 2007, Harbourfront Center, York Quay Gallery, Toronto. Visitors were invited to bring along their faulty objects, precious or not, to have them repaired or revamped. 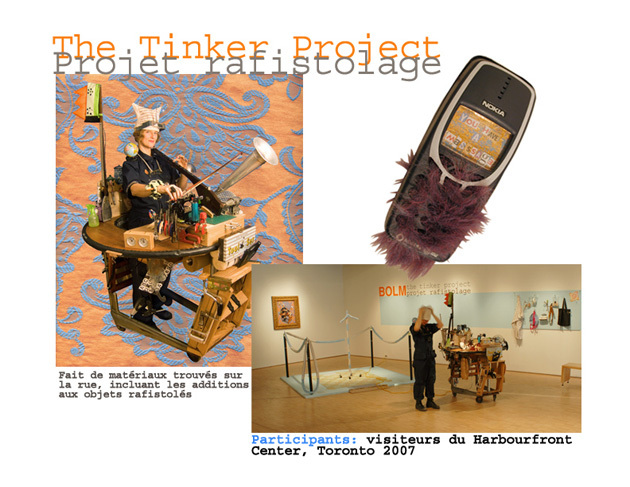 The visitors would become 'clients' of the 'Tinkerette' (myself) who could handle many trades, namely jewelry, textile, woodwork and low-tech mechanics. 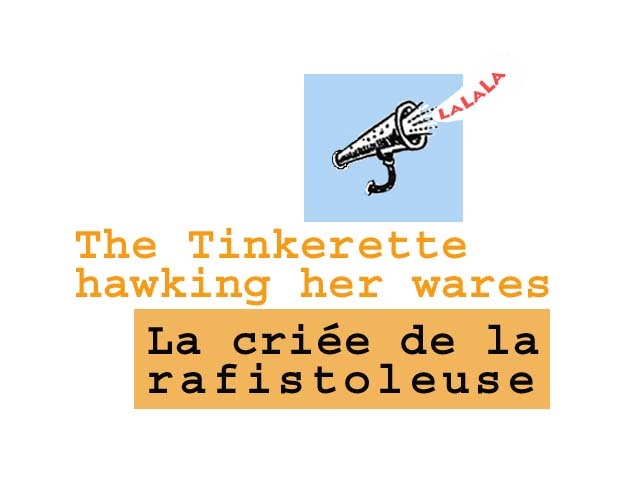 In compensation for the work, whether technical or poetic, the Tinkerette would receive money, services, or objects of the clients' choosing, reflecting in value their appreciation of the work. A logbook recorded the thirty-four participants' objects' history, before and after. Interactive project with the collaboration of people who could benefit from more freedom, courage and creativity in their lives. Mix of objects and images, situations and new media happening in three locations at the same time: installation at HACKlta href="http://www.mercerunion.org/"HACKgtMercer Union: a Centre for Contemporary ArtHACKlt/aHACKgt, performance in the streets of Toronto, and online at HACKlta href="http://la.bolm.ca"HACKgthttp://la.bolm.caHACKlt/aHACKgt as a weblog.